E-statements and E-Notices from First National Bank of Northfield offer online customers a safe and convenient way to review their account transactions and balances. You can choose to receive E-Statements and Notices for your checking, savings, certificates of deposit and loan accounts. 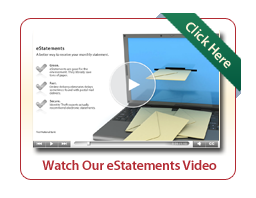 You will be notified by email when your monthly statement or notice relating to your accounts is ready for viewing. You may view it at your leisure. E-statements and E-Notices will be accessed through our online banking service and receive the same security protection as all of our online banking transactions. There is no need to worry about mailbox theft. No paper. No envelope. No need to shred. E-statements and E-Notices will be archived for 32 months. If you need a hard copy for your records, you may print the pages you need. Click below for instructions on enrollment in and viewing e-statements. Or, view the demo. Sign up for or log in to online banking to set up e-statements. Check out our great mobile apps.